Highland Hill farm is a tree,plant, and shrub grower located in Pa. We have been growing nursery stock for over 25 years. Let us help you with your landscaping needs. Open daily from 8:00 a.m. till 5:00 p.m..
Highland Hill Farm welcomes you to our store for the purchase trees, plants, and shrubs. Order seedlings,shrubs,or large trees from us. Call us to discuss your plant needs. We help the beginners to find the best seedlings and plants. we offer advice on types to buy for those who want to start to grow nursery stock. On our farms we raise and sell nursery stock from seedlings to large caliber trees. We also offer infomation on the web ABOUabout seedlings , and how to CARE for seedlings and nursery stock. If you buy your seedling from us you will have access to the free use of our planters.We have three types available for use and have had years of experience in planting seedlings. Our planting equiptment is located in Fountainville Pa. (near Doylestown) and Milan Pa. We are dedicated to helping you with your plant needs. You will find articles we have written to help you and explain how we do what we do. We will be glad to assist you. We welcome everyone to come to our farm, if we have time we will give you a tour and show you how we built up our nursery. There are no trade secrets to our operation and we feel that in helping you we will become sharper ourselves. Our phone number is 215 651 8329. Okay campers: This tree proves that scientists don't know when a tree is extinct. Fossil records showed that this tree was extinct for 35 million years, yet this deciduous conifer fooled them all until 1945 when it was rediscovered in a remote valley of Central China in 1945. Dawn Redwood or The Dinosaur Tree, is offically called, "Metasequoia glyptostroboides". The Dawn Redwood first came to America in 1945 in seeds and has shown to be viable in zones 6 to 8. This tree grows fast and can reach 75 to 100 feet by 25 feet in diameter. It likes full sun to partial shade and is tolerant of moist to dry soils with ph ranges of 3.7 to 7.0. Go ahead and plant it in clay soils, loam or sand. Its bright green, feathery, needle-like foliage will turn brown and will drop quickly in the fall. Thus this plant will be suitable for a great summer screen or a specimen plant. This plant is great for a Hort 101 beginner. 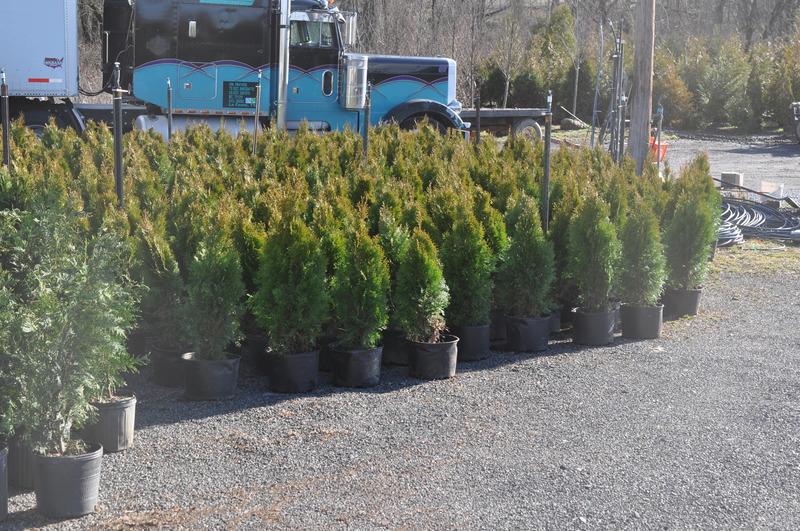 It is easy to grow, pest free, adaptable, grows fast, and has soft bright green needles, and of course we have hundreds of 3-4' plants ready for your landscape. Arborvitae are commonly used evergreen shrubs or trees useful in urban areas where low maintenance and durability is needed. Many cultivars with forms such as being globed in shape, narrow pyramidal, or columnar, tend to be near buildings, doors, and walkways. Other forms which are larger are used for screens and buffering that are usually in rows. 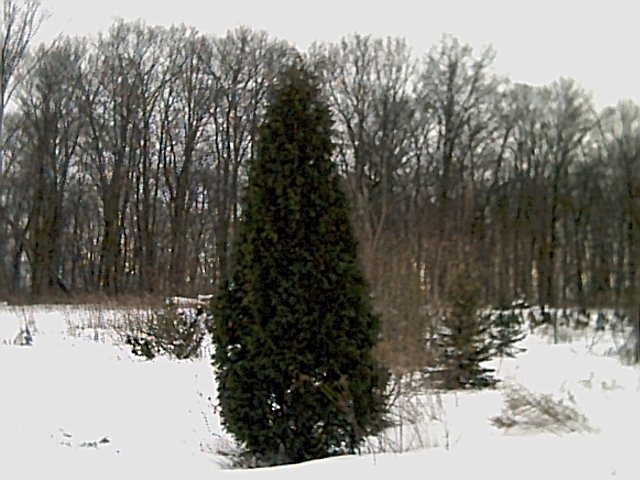 The form of arborvitae can be small, medium, or large depending on the cultivar. Some reach 40-50', others only 3' tall. Most prefer full sun to partial sun. Planting in dense shade conditions should be avoided as they will fail there. A moist , well drained, loamy soil in full sunlight are ideal conditions for growing healthy arborvitae. These plants can tolerate rocky, clay, urban conditions of heat drought and pollution. The most worst pest we have is bagworms and Japanese Cedar Longhored beetles which must be controlled to prevent complete defoliation or limb death. Some cultivars have multiple lea ders which also prove to be a detraction for the plant. The Hetz Midget arborvitae is a dwarf globe variety. This is a good choice for along walkways and gardens. This is a tough plant that is easy to install and not going to cost a lot. It will maintain its color in the winter and will withstand snow loads well. These are Emerald Green Arbs, about 3' high. Most of these are a single leader. We have these in quanity up to 6'. This is an Elegantissima arborvitae hedge that we have used to buffer the street in front of our home. Note the strenght of this plant even with a heavy snow load. The only problem that this hedge has is salt spray from the road. Its a real sound barrier to a busy road which is only 18' from our door. The hedge is 15-18' high and only 4' wide. We have these arbs form 2-3' to 6-8' B&B. This past spring my neighbor noticed that our arbs have produced mini-like pinecone looking nuggets, which are bronze in color, all over its branches. Some of them dried up and fell off, but most remained. He asked me if they could be lacking acid. He insisted that this was not the normal. He could easily see that there is plenty of new growth. He is worrying needlessly. The fruiting bodies are an indication of the plant’s maturity. Some are more prolific at producing than others. As long as the plants are maintaining their rich full green color there is nothing to worry about. My first real adventure with Eastern Red Cedar happened on the farm I grew up on. It was located south of Lambertville N.J. on the Delaware River. Our farm was located on a mountainside and it had been clear cut more than 75 years before. Cedars were like pioneer invaders, Cedars would take over in areas were there were clear-cuts, abandoned fields, places where topsoil had been scraped off and generally were other plants had a tough time becoming established.It didn't mind clay or rocks and here the Cedars found a home. Over the years, other trees took hold and the cedars continued to grow. After many years, the oaks nearby began to tower over the Cedars and the Cedars began to decline. One Cedar caught my eye one day while hunting. I had heard that Cedars were valuable for wood to make cedar chests, closet linings, cedar shaveings, and fence posts. I knew the lumber was selling for a over a dollar a board foot. Forty years ago that was a lot on money to a farm boy and I couldn't let that get away. I figured that this tree had to be 25 feet up without a branch, and was almost 3 feet at the base. Now you can do the math, this was something I had to do. I went to the barn and got the chain saw and went up to the cedar and began to cut it down. It didn't take long and I realized that it was hollow. So I figured I would continue. Maybe the tree would be solid up a few feet and my money tree would be. With a big crash the giant was slayed. I proceed to cut up the top of the tree and to my supprise it was a bee tree. A colony of honey bees had made its home inside this tree. So now I began plan B. I decided to join the 4-H and this colony of bees became my first beehive. So now whenever I see a large Cedar Tree I think of my money tree. 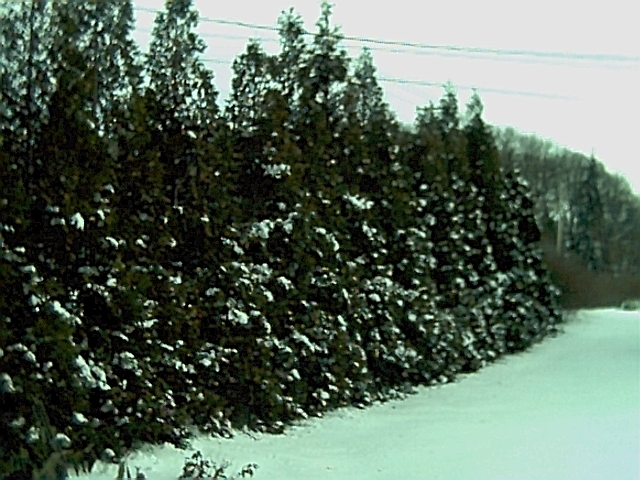 Cedars serve as wind breaks, and are good trees to help with erosion control. Red Cedars are really in the Juniper Family and are related to Arborvitae and False Cypress, and are representative of the many landscape Junipers. 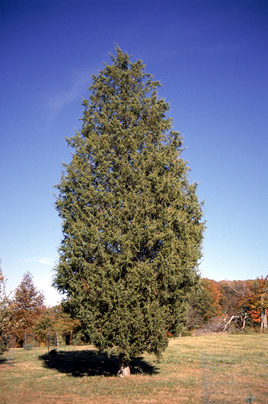 Most full grown Cedars you find will be from 30-35 feet tall and with diameter of 15 feet. 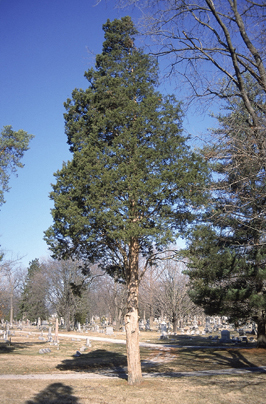 The best examples of full grown cedars are usually found in cemetarys. Here they are in the open and the grounds are maintained around them, they grow to exhibit their full form and devolpment. 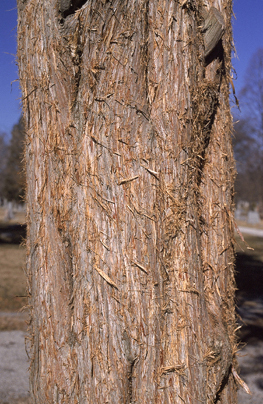 Red Cedars are a rugged plant. Cedars can tolerate fertile, sterile, rocky, sandy, clay, dry, or moist but well drained places. This plant likes to be neglected and will grow under harsh conditions including smog, reflected light and intense heat in urban locations. The only pests that I really worry about are bagworms. These can defoliate your nursery stock. June is time to start looking. It's time to inspect junipers, arborvitae and pines .... even broadleaf shrubs and trees like rose, sycamore, willow, beech, maple, elm and black locust. The bagworm gets its name from its spindle-shaped bag that the caterpillar carries around as it feeds on your plants. The bag is woven from silk and is covered with bits and pieces of leaves and twigs from the your plant. The bag of a worm feeding on juniper will not look the same as the bag of a worm feeding on willow. Ultimate size will be slightly over one innh and hang down on the plant. The larva itself is dark brown with a yellow head and yellow and black spots on the body. You will have a tough time opening up the bag to see it. Adult females are wingless and lack usuable legs, eyes and antennae. They are almost maggot-like, and seldom seen. Adult males are typical moths, black and densely hairy. Wings are nearly clear with a span of about an inch. I have never seen one in our nurseries only in pictures. The problem with bagworms is that they defoliate them. Heavy populations kill will an ornamental arborvitae and juniper. But control is possible. The larvae hatch from overwintering eggs in the spring usually in May. Each larvae spins a silken bag that it carries about while it feeds on the plants foliage. As it inlarges, the larva enlarges the bag as it keeps adding bits of foliage as camouflage. Many people don't know that the bag is there because it looks like a seed pod on shrub or tree. Because the larval stage is the only mobile stage, one bush can have a high population and another one several feet away can be free of bagworms. Several parasites feed on bagworms. Birds eat them and the worms can be killed by low winter temperatures. A very effective control is to pick the bags off the host plant in the winter. Young bagworms are especially sensitive to the bacterium Bacillus thuringiensis. This is commercially available under the trade name Dipel. The disease caused by the bacterium affects only the moth larvae and is very safe to use. Always read and follow label directions before treatment. Best results will be obtained when spraying in late afternoon or early evening. Treat early when you first notice the bagworms, since small larvae are easier to kill. Other insecticides which will control bagworms include acephate (Orthene) and carbaryl (Sevin). There are some mites, midges and bettles that can be problematic. Rusts, make the tree unsightly don't harm this tree but can effect other plants such as pines and apple trees. If you are looking for a hardy, native evergreen, for a constrution or landscape site that needs little care, this is your tree. We have plenty of seedlings and B&B trees upto 6' ready for your pickup. Its best to call in advance if you want more than 10 as we will dig them fresh for you.